These schemes are focusing on a few topics only, leaving a lot of health concerns unattended. Moreover, they are not locally adapted. There are many local public health workers (ASHA, ICDS, ANM,…) who deliver these (mainly preventive) schemes, but due to poor communication and coordination by the local authorities (to start with the Gram Panchayats GP) people are barely aware of the services they are entitled to. The curative services are below standard as well, with staff being present (if at all) only a few hours per day and with a poor quality of services, both technical and relational. Attempts to fill this huge gap are made by local ngos and private providers (quacks, private doctors,…) which are mushrooming without any proper regulation. Traditionally the grassroot ngos (mostly CBOs or Community Based Organizations originally) focus on particular topics (clean water, vaccination, maternal care, eye problems, girl trafficking, HIV,…). But they lack a comprehensive vision on the needs of the villagers and focus principally on solutions at village level. However, a lot of problems at village-level require solutions which should come from the higher level. The introduction of the NRHM (Now NHM) by government gave the Basic Health Care program a big boost. It provided opportunities to make the existing health system more functional. Synergic actions were created at the community, Gram Panchayat, Block and district level through a collaborative process. NRHM programmes created spaces for Partners and community members to be part of the decision making bodies and to push a people centred programme. The Basic Health Care Support (BHCS) program is implemented by WBVHA in a partnership with a network of local grassroot NGO; Memisa Belgium and DGD Belgium. BHCS is about creating a conducive environment where communities have access to quality health services and are empowered to claim the right to health. The strategy used to do this is through health system strengthening. A better local health system will create a better environment to respond to people’s needs and to implement the national health schemes, both actual and future schemes. This program is not about implementing as many schemes as possible in as many places as possible. It rather focuses on engaging a learning process, starting from the experience in a few selected areas, up to the policy level. The BHCS program coordinates the functioning of 5 NGO-forums in 5 different districts, all together bringing together 37 NGO’s. They work with a network of Village Health Workers in different villages. 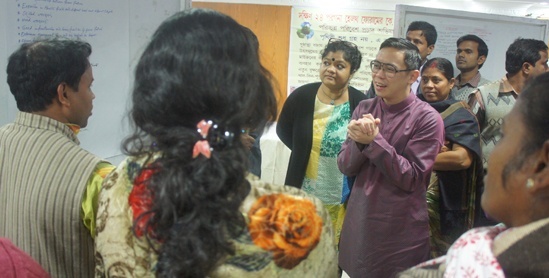 Basic Health Care Support Program is implemented in 74 Gram Panchayats in 28 blocks in 4 districts of West Bengal namely; South 24 Parganas, North 24 Parganas, Howrah and Darjeeling and in 1 district of Sikkim namely; West Sikkim. Development of health plans, strengthening health systems, identification of policy and operational gaps, and making appropriate policy changes. Gender equality is the main condition to fulfil the objective of BHCS program. Several activities of the program clearly describes about the target population mostly focussed towards women and girl children. The objective of the project can never be fulfilled without the commitment of gender equality. 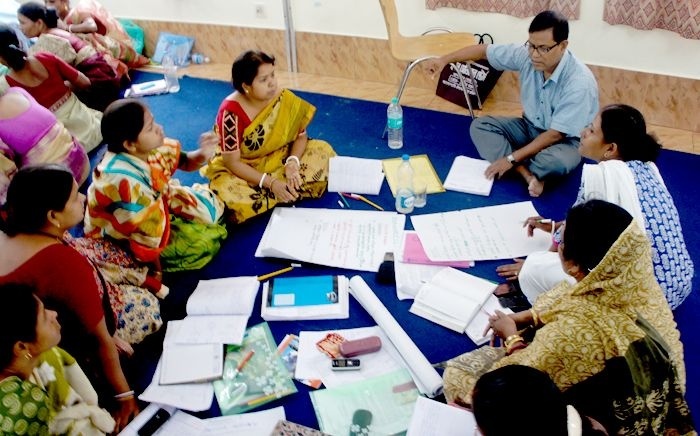 · Monitoring and Supporting VHSNC: The government approved community groups like VHSNCs are very much similar to the VDC/SHG/NHG those were created by BHCS in past. BHCS team members are specially trained by government to guide and facilitate VHSNCs at community level. One hand the partners are providing training to the VHSNC members and on the other hand the many of the members of VDC/SHG/NHGs are now in the VHSNCs to represent their groups/communities. · Assistance in developing health plans: BHCS partners of South 24 Parganas were engaged in facilitating VHSNCs (as a member or as external) in preparing need-based health plan. This is also to be followed by North 24 Parganas and Howrah. Darjeeling does not have functional NHM services except few components because of non existence of PRI system. BHCS plans to do advocacy with GTA to initiate the VHSNC concept in Darjeeling. · Issue Based Local Initiatives: Issue and need based local initiatives had been undertaken by the local population facilitated by BHCS partners. Some of such initiatives are 1/Resilient Tube Wells managed by village maintenance committees; 2/ Repairing of drinking water source; 3/ Repairing of ICDS Centre through local resource mobilisation; 4/ Organic kitchen garden, 5/ Road repairing after landslide; etc. · Networking of Adolescents: 194 adolescent leaders are engaged in peer counselling, child protection campaign, anti trafficking movement and act as resistant group for early marriage; school drop-out. Some are also engaged in home-based geriatric care and counselling. · Promoting accountability and transparency mechanisms on health programme at different levels: One important tool for promoting accountability and transparency is community information board and this is practiced since long by community groups. Due to the demand from community groups the SCs and AWCs had started similar display in their respective centres. 72% and 61% of SCs and AWCs respectively are regularly maintaining and updating the display boards. · Improvement of AWC with local collaboration and cost sharing (South 24 Parganas). · Minimizing operational gap by Health Forum: The DHFs consolidated the operational gaps identified by the community groups which have been minimized through local level advocacies. The annual mission in 2016 composed of the WBVHA team members, external consultant, medical advisors of Memisa, Professor of Institute of Tropical Medicine, Antwerp. The purpose of annual mission was to learn the progress of BHCS and formulate strategies to promotes and strengthen the local health system from Block to District and Strengthening advocacy at the strategic decision-making levels (district and state). - A day-to-day follow-up of documentation and research activities is highly essential in collaboration with likeminded institutions such as IPH or ITM. - Comprehensive strategy for knowledge management at the level of WBVHA and the Forum partners. - Reporting by the Forum partners should have enough focus towards some strategic, priority issues. - Optimizing sharing of interesting papers between WBVHA, IMT, IPH and Memisa. This implies i) being more selective in sending information in order not to overload people with too much documents, and ii) have a discussion around papers and concepts (two way process). - Inclusion of component of Health System Strengthening in the 10 year strategic plan of WBVHA. - Documentation, Monitoring, and Research are knowledge generating activities that capture the rich experience of the program in supporting implementation of government health programs. - There is a need to build capacity of WBVHA BHCS staff on policy analysis with understanding the various policy space, finding appropriate policy windows and stakeholder analysis. - Dr. Ketaki Das, our Public Health Research Officer has successfully completed an E-Course on Public Health Management (advanced) from Institute of Public Health, Bengaluru. - Mr. Sandip Bagchi, Project Assistant is undergoing a course on Masters of Public Health (MPH) from Institute of Tropical Medicine (ITM), Antwerp, Belgium from 1st September 2015 to 31st July 2016. - Dr. Ketaki Das, was invited as Guest Lecturer by Indian Institute of Social Welfare and Business Management to speak to the students of Masters of Public System Management with Specialization in Health Care and Hospital Management, on Qualitative and Quantitative Method of Field Survey. 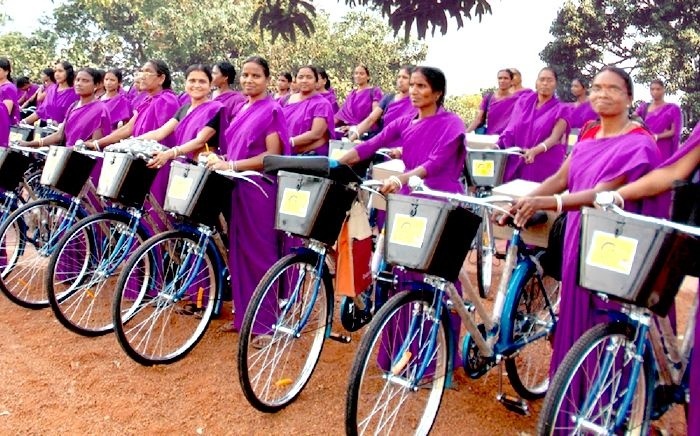 The BHCS members were engaged in a task for ‘Impact Assessment study to assess the utilization of bicycles by ASHAs in 23 LWE affected areas in three districts of Purulia, Bankura and Paschim Medinipur. This task was commissioned by The Mission Director, National Health Mission, Ministry of Health & Family Welfare Department, Government of West Bengal. Community feel responsible for proper utilisation and maintenance of the services meant for them. Drinking water is precious for the community, hence cannot be let wasted. In few places the community initiated for waste water management. At the side of tube-well platform they dug a bore with a long pipe underneath for water seepage. The experience says, those who were very resistant in past have come forward to seek help of other groups to learn the mechanism of creation of emergency health fund. The topic of stewardship of the local health systems and the role of the forum came up as a possible interesting domain for a more in depth analysis of BHCS program. 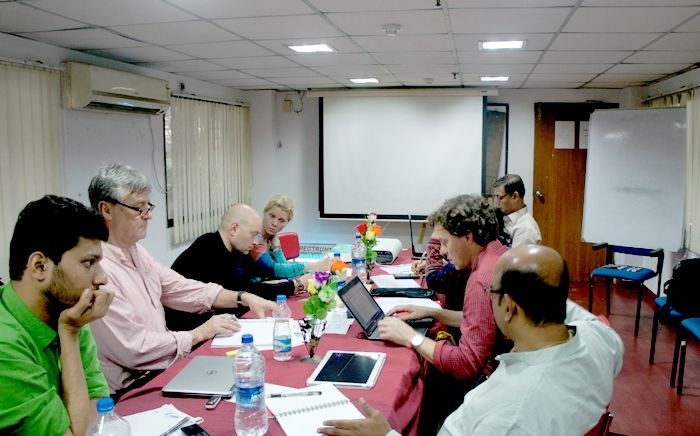 The concept has been shared with researchers from ITM, Antwerp through a teleconference. BHCS Program seeks to increase visibility and credibility of its actions and creating a field for this research as a win-win situation by all actors involved. · Mr. A.Ghosh, Documentation Div. And many members of SHG, NHG, VDC/VHC, VHSNC, Adolescent Groups and PRI. Asha Kiran – a Primary Health Care Centre with special attention to women and children, is implemented by Kautala Friends Sporting Club, Mathurapur II, South 24 Parganas. The project is supported by Mr. and Mrs. Jean Claeys and Dr. Leo Blancke and jointly facilitated by Memisa, Belgium and WBVHA. Asha Kiran has Full-time RMO, GNM, ANM, GDAs and other necessary staff members. It also has 5 doctors (part-time) and 2 nurses for out-patient division, 1 lab technician, 1 lab assistant and 1 pharmacist. With the leadership of Mr. Samir Kumar Halder, the performance of Asha Kiran is praise-worthy. The project is regularly guided by Dr. Peter Kok, Medical Consultant, The Netherlands and Mr. B. Basu and his team members of WBVHA. In addition to its in-patient maternity care services, Asha Kiran has also started its indoor for general patients. A team of 5 health workers are in regular contact with old patients for follow-up as a part of their field work. 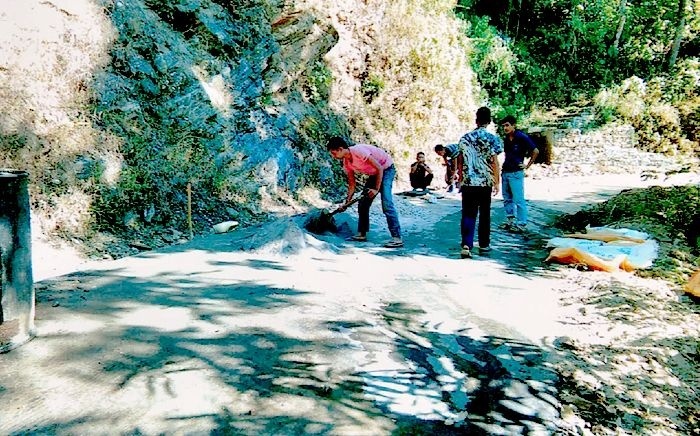 GTA – Gorkha Territorial Administration – the local governance in Darjeeling district.